The Short-Term Rehabilitation neighborhood offers private accommodations designed for residents in need of intense therapy in order to return to their home. Annually, 62% of Grace Rehabilitation and Health Center residents are discharged upon healing. Short-Term Rehab offers residents greater independence and close proximity to the Rae S. Larcom Therapy Center, Sunset Auxiliary Gift Shoppe, Beauty Shop, and front entrance lobby. Residents enjoy made-to-order options from the Neighborhood Grill Restaurant. 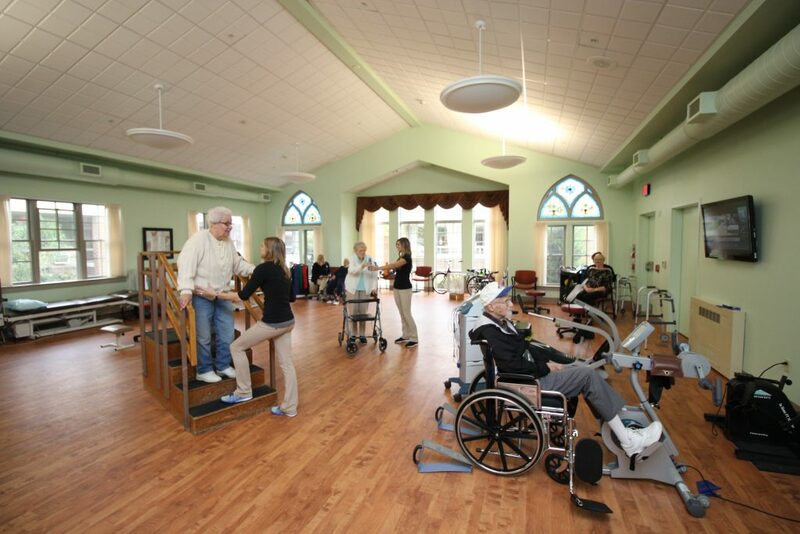 Why choose Wesbury over other rehabilitation facilities? The number of Residents that have an emergency room visit or are hospitalized after admission to Grace Health Center is below the national average. The number of residents that come to Wesbury for rehabilitation and are discharged to their homes is above the national average. In comparison to other local nursing homes, Grace Rehabilitation and Health Center has the lowest readmission rate to the hospital. Multiple levels of care and programming are designed to meet individual needs so each resident may reach their fullest potential. So, what therapy services does Wesbury offer? The Rae S. Larcom Therapy Center offers a complete menu of comprehensive rehabilitation services. Our therapists are trained in clinical best practices and advanced clinical programming to restore and maintain an individual’s maximum independence level. These services include physical, occupational and speech therapy. Outpatient rehabilitation services are also available. To learn more download: Symbria Rehab Brochure or Wesbury’s Grace Rehabilitation and Health Center’s Brochure. Performs evaluations, develops and implements treatment plans and provides ongoing assessments to individuals with deficits in transfers, mobility, strength, coordination, balance, range of motion, ambulation, and endurance. Treatments also may include pain management, wound care, fall prevention, modalities, non-invasive urinary incontinence retraining, splinting, and neuromuscular reeducation. Performs evaluations, develops and implements treatment plans and provides ongoing assessments to individuals experiencing a decline in their functional abilities. Treatment may include activities of daily living (ADL) retraining. This could include self-feeding, bathing, dressing, meal preparation, laundry, financial management, etc. Other approaches include transfer, balance, coordination, safety and cognitive retraining, as well as range of motion, strengthening, and endurance building. Treatments may also include splinting, positioning / pressure relief, urinary incontinence retraining, and pain management. Performs evaluations, develops and implements treatment plans, and provides ongoing assessments to individuals experiencing speech, language, cognitive linguistic, and swallowing difficulties. HeartCare is a multi-faceted program to help in transition from the hospital to home after a diagnoses of heart disease, including heart failure, heart attack, bypass or valve surgery, heart transplantation, or stent placement. The goal is to provide continued care in each setting that may be encountered after being discharged from the hospital, including local short- and long-term care facilities and to the home. This ensures patients receive all that is needed to maintain a healthy heart and lifestyle. Each Center of Excellence/HeartCare partner’s facilities and services are appropriately trained for heart patients with the standards that are developed from Allegheny Health Network cardiac physicians, surgeons, and cardiologists. As a partner, Wesbury looks to help ensure a smooth transition during each step in keeping the heart healthy by providing standardized care, remote patient health monitoring, rehabilitation therapy, education for the patient on how to manage their heart condition, and clinical follow-ups with physicians and cardiac professionals. This is one of the only programs of this type available in the country, and the HeartCare Program is overseen by leading cardiac doctors who are responsible for caring for their patient’s heart regardless of where they are receiving care. For more information on St. Vincent Hospital and the Allegheny Health Network, visit www.AHN.org. Pain Management – Reduces frequent pain and pain that interferes with function. Falls Prevention – Reduces the risk of falling. Investigates and addresses why a fall has occurred in the past three months or why a resident may be fearful of falling during ADLs. Contracture Management – Improves range of motion with movement of the upper or lower extremities. Neuromuscular Reeducation – Improves endurance or strength. Wound Care – Improves chronic ulcers resulting from edema, necrosis, or circulation problems. Urinary Incontinence – Reduces urinary leakage or frequency/urgency to urinate. Vital Stimulation Dysphagia Therapy – Corrects difficulty or discomfort with swallowing. What happens at the end of my Rehabilitation Stay at Wesbury? As you near the end of your Rehabilitation Stay at Grace Rehabilitation and Health Center you can have a home evaluation and discharge meeting to setup services if you find you need additional support when you return home. The home evaluation helps determine if you need any changes completed in your home to make it as safe for you as possible. For example, do you need grab bars in the bathroom area, a stair chair to help with getting up and down floors in your home, maybe floor rugs need removed as they are a tripping hazard? Wesbury therapists can help you determine any unsafe areas. If you need assistance with meals, help with laundry, housekeeping or traveling to appointments Wesbury’s Help at Home Companion or Meal Delivery services can be hired to provide assistance. VNA Home Health Services are another wonderful addition if you want in-home therapy or nursing services coming to you for a determined length of time while you are acclimating back to your home. What if I am not ready to return home and my insurance cuts me? You have a couple options, you can stay Grace Rehabilitation and Health Center until you are ready to return home, or you can also transition to Cribbs Residential Center – Enhanced Living and Personal Care, as long as you are medically appropriate as a respite stay and continue outpatient rehabilitation at Grace or receive VNA Home Health Services at Cribbs, at a lower cost until you are able to return home.